Chris Warne at Virgo Motorsport confirms that the team’s brand new Ferrari 430 (it’s being built up at Michelotto right now) will be driven by Dan Eagling, Ian Khan and Tim Sugden, in this year’s Le Mans Series. The team has a full-season entry for the LMS. “Yes, we’ve got a good blend of youth, speed and experience,” explains Chris Warne. There are several connections between the three drivers and the team owner – the longest-standing being the fact that Warne ran a BMW for Ian Khan as long ago as 1992 (he won the Group N Championship in the UK), the following year seeing Khan drive a Warne-run Ecurie Ecosse Vauxhall Cavalier in the BTCC, this time finishing runner-up in the Independents’ Cup, to Matt Neal. “I then won quite a few races in the Ferrari Challenge,” adds Ian Khan, “and while I moved on to other things, Chris carried on running Ferraris. Khan and Sugden have driven together on several occasions in the recent past, in the former’s Porsche(s) – notably in the LMES in 2004. Now they’re moving on to a Ferrari – or back to a Ferrari, as both have Prancing Horse experience: Tim Sugden is much better known for his efforts in Porsches of course (he’s the current Porsche Cup Champion), but did race a Veloqx Ferrari, twice, in the 2002 FIA GT Championship. In the first of those races, he steamed into the lead early on at Donington Park, and pulled out a 20 second gap on the rest in N-GT, but the car retired with engine trouble, while he and Andrew Kirkaldy finished third in the last race of the season, at Estoril. A shakedown at Fiorano will be followed by a test in the UK, then it will be the Paul Ricard test days at the end of the month, then off to Istanbul. The Ferrari 430 is supported by Teng Tools, Dunlop, Shell and Sea France. 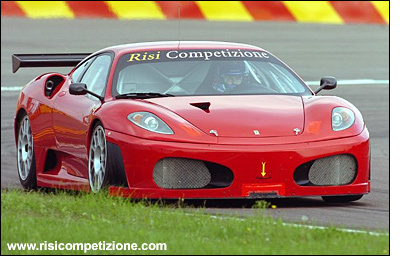 This is the Risi Ferrari (or a 430 with a Risi Competizione windscreen strip) on test at Fiorano.